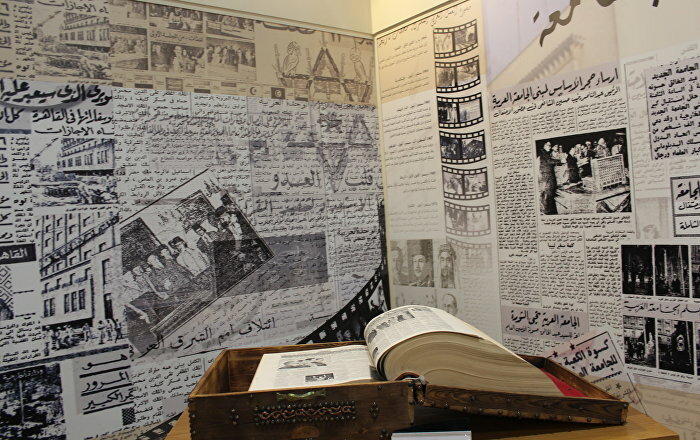 The Arab League Pavilion at the International Cairo Fair in its fiftieth "Golden Jubilee" session presented a large collection of books on the history of the University and on Arab history. Among the important books presented we find "University Archive Book", a brochure on the university from 1943 to 2015. The book contains 5,000 publications on Al-Ahram University, weighing sixty pounds inside a wooden box specially prepared for him. The press publishes the most important images of Arab leaders and leaders during the first summit, included in the declaration of the first decision by Arab leaders to establish the unified Arab army, when the team was selected Ali Amer, commander of the United Arab Army. The declaration spoke of the creation of the unified Arab army to deal with the Israeli threat in 1964. The Arab League "Deif Sharif" is the golden jubilee of the Cairo International Book Fair, in the presence of guests of honor during the previous sessions of the Book Fair. The exhibition has seen many changes in its current session, has begun to transfer it to the new Egyptian exhibition center in New Cairo, the participation of 20 Arab countries, the selection of the League of Arab States as a guest of honor and four rooms for the main symposia, the first for books on heritage, foreign books, third for Egyptian publishers and fourth large exhibition hall.